We're proud to unveil the new Board Game Central! If you've been here before, you'll notice that everything looks different, but hopefully not unfamiliar. You should still be able to find what you're looking for without too much trouble. #1: Make the site more pleasant to use. The old design was functional, but was definitely showing it's age. The new design is more modern, more attractive, more functional, and should be easier to maintain. #2: Make the site more useful. 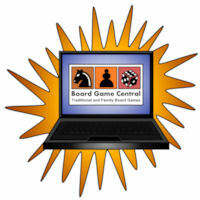 Board Game Central began as a simple portal, a collection of links to other board game sites on the web. Helping you find the best board gaming sites on the web is still a major part of our mission, but we want to expand on that, adding unique, interesting, and compelling content of our own. #3: Focus more on online games. At this site's inception, online gaming was pretty primitive, so we chose to focus on board game software that you download to your computer. Today, online games are a major part of the board gaming experience, more so than downloads. We plan to expand this section considerably over time. An easier-to-use dropdown menu system. Added a bunch of new links (and plan to add many more). Transitioned the board game news section to a custom blogging platform, to hopefully make it easier to maintain. You can now comment on most pages (not just the news), which will allow you to ask questions and discuss games. Improved and streamlined feedback and submission forms, which should make it easier to suggest new games, report broken links, and ask questions. Easier to share content from this site with your friends on Facebook, Twitter, or other social networking sites. Easier to track new board game releases. We're pretty proud of the way the new site looks and feels, and hope that you agree. We look forward to makign this a place you'll want to visit often!